Beyond the Khmer touches throughout each guestroom, Le Méridien Angkor hotel’s amenities include a swimming pool, Le Méridien Angkor Spa and a variety of cuisines at each of the hotel’s dining venues. Offering the finest wines in the city of Angkor, L’Angelo restaurant serves savoury northern Italian cuisine with an Asian flair. The hotel also features a variety of meeting facilities and banquet spaces. The Sofitel Phokeethra Royal Angkor is set among tranquil landscaped gardens on tree lined Charles de Gaulle Avenue and is the closest hotel to the ruins of Angkor Wat. The resort is near traditional markets, local tourist attractions and only 15 min drive from the airport. Combining French and Khmer architecture to provide elegant accommodation, the hotel features 238 rooms, a swimming pool, Jacuzzi, spa, five restaurants, three bars and the Phokeethra Country Club, a world class 18 hole golf course. Located in the heart of Siem Reap, Sokha Angkor Resort is the perfect blend of art deco and Khmer design, creating a haven of comfort and luxury. The rooms here exult in their colonial history with spacious hardwood floors. It offers the full holiday works, including a spa, pool, fitness center, tennis, restaurants, all set in lovely Khmer-styled buildings. Sokha Hotels & Resorts - luxury landmarks with unmatched service. Within the five star Victoria Angkor Resort & Spa enjoy the comfort, elegance and superb refinement of the French Art de Vivre in the heart of Siem Reap. The building's graceful colonial architecture of the 1930's provides a sense of peaceful tranquility. 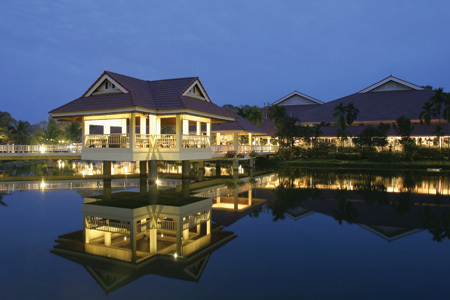 The Hotel has been designed to be in total harmony with its natural surroundings and is enchantingly situated in ideal location, which is close proximity to World Heritage listed Angkor Temples, the quaint old market town of Siem Reap and only 7km (4.3 miles) from the International airport . Amansara was once the guest villa of King Norodom Sihanouk. Transformed into a 24 suites retreat, the resort is set in a lush garden compound with the inviting ambiance of a gracious home. Situating in the bustling town of Siem Reap, it is located 15minutes from the airport and 10 minutes from the entrance to Angkor, Cambodia’s world renowned archeological park.